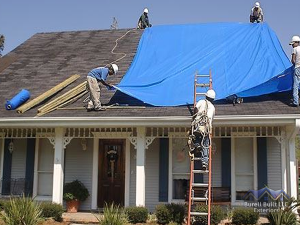 When the unexpected occurs and you’re taken by surprise by damage to your roof or exterior, don’t hesitate to call the trusted team at Burell Built Exteriors any time of day! We offer full service support to residential and commercial customers, and promise that we’ll answer your calls 24/7. We know that you want to quickly minimize further issues when you sustain damage to your roof, skylight, chimney, siding, etc. We will get one of our highly-qualified contractors on site fast to assess the damage and plan with you a course of action to address the issues. We’ll even work with you to file insurance claims and navigate that process as your dedicated roofing contractor. Call us right away for prompt emergency roofing services for your Knoxville, TN or Chattanooga, TN area home or business! While nasty weather and storms are often to blame for emergency roof damage, there are some key areas where we tend to see issues crop up. We’ll take care to fully inspect these roof components as the possible source of leaks or interior damage. Poor Initial Installation – While roofs are of course subject to wear and tear as the most-impacted surface of your exterior, they don’t spontaneously break down. One of the most common causes of roof failure is poor workmanship during installation. The issues may be widespread and only surface in certain conditions. Trust our team of manufacturer-certified professionals to handle all aspects of your roofing repairs and replacement, and know that you’re getting the job done right! Vent Stacks & Plumbing Collars – Many Knoxville and Chattanooga area homes are equipped with vent stack and plumbing collars made of sub par materials that inevitably wear over time. Lack of proper ventilation can exacerbate issues and further reduce the life of these materials. Rubber boots will eventually succumb to the heat rise vapors, and even plywood surrounds must be checked regularly to prevent these vents from becoming an invitation to leaks. Ventilation – As discussed regarding vent stacks, ventilation is key for ensuring that your home or business not only functions efficiently (especially for your heating and cooling system), but to also protect the lifespan of your roof. Poor ventilation, which is unfortunately very common in homes built in the 80s, 90s, and early 2000s, can cause unnecessary wear on your roof and roofing components. Our team can work with you to revise the ventilation design of your home or office, and can also discuss insulation solutions to extend the life of your roof and prevent long-term damage and wear. Chimneys – Roofing standards in Tennessee for chimneys have been a problem for over 20 years. Typically to blame with issues arising from chimneys are cracked mortar due to lack of maintenance and age, or unsecured flashing around the chimney which can allow leaks. Call us any time, day or night, for emergency roofing services for your Chattanooga, TN or Knoxville, TN area home or business! Updated on September 20, 2016 at 8:27 pm by Burell Built Exteriors.